Harry Jackson Sculpture and Abstract Expressionism | Skinner Inc.
As a young man, Harry Jackson served as a combat artist in the Marine Corps during World War II. He returned from the war seeking an outlet through his art for the intense experiences he had undergone, finding in color a way to express emotional content. When he encountered She Wolf, a 1943 painting by Jackson Pollock, the power of abstraction to express force and tension greatly moved him. As young painter opening a New York Studio in 1946, Harry Jackson found inspiration in works by Pollock, Robert Motherwell, and the Mexican muralist José Clemente Orozco. He had the opportunity to meet Jackson Pollock, and the two became friends. Harry Jackson admired the power of Pollock’s paintings, likening the violent motion in his 1943 mural done for Peggy Guggenheim to a rush of stampeding cattle. Fast forward to 1957 and we find Harry Jackson at work on a commission of just that, a cattle stampede. Jackson had received a commission for two mural sized paintings from his friend Robert Coe, one of a stampede and a related work of a cowboy burial on the range. Jackson by this time had moved from abstraction back to figurative work, realizing his deeper desire to show volumes in space. Yet he still drew upon the strengths he saw in contemporary art, what he described as “the compositional force of Franz Kline, the romantic atmospheres of Rothko, the pungent elegance of De Kooning, the passion of Pollock.” As he worked on the pair of complex paintings for Coe, he began to sculpt many of the figures in order to understand them better in three dimensions. His goal was to portray each figure as a separate character, physically and emotionally distinct, contributing to the painting. His fascination with sculptural form led to the Coe commission being expanded to two paintings and two large bronzes on the same subjects. Jackson was working in Italy at the time, using a foundry in Pietrasanta, and in 1964 he established is own foundry to accommodate his growing endeavors, the Wyoming Foundry Studios. By 1960 Jackson knew that sculpture had taken an equal place in his heart alongside painting, and he felt that the two were somehow destined to complement and aid each other in the future. Jackson’s inkling of the combination of sculpture and painting was soon to bear fruit. 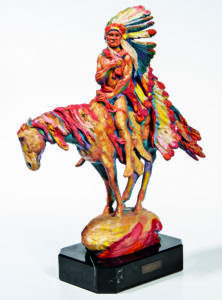 By 1963, color had emerged, at first conservatively, as an important aspect of his sculpture beginning with Cowboy’s Meditation. His dream became to make polychrome bronzes that were, in essence, three-dimensional paintings. Jackson sometimes found the bronze too formal and sought the realism that color brought to the pieces. His bronze editions began to be released with a traditional patina and also in painted versions. Jackson described the combination as a way to let painting “bust out of its own space” and sculpture to merge with the larger realm of space and color. He wanted his sculpture to take its natural place in the vivid, color-filled world we all inhabit. The quotes in this blog are drawn from the book Harry Jackson by Larry Pointer and Conald Goddard, with commentaries by Harry Jackson (New York: Harry N. Abrams, Inc., 1981). 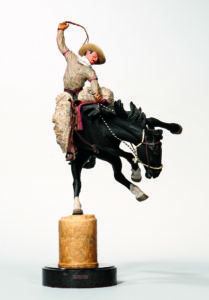 This entry was posted in Blog and tagged American artist, bronze sculpture, fine sculpture, Harry Jackson, sculptor, Western Art by Elizabeth Haff. Bookmark the permalink. signed by the artist with description of meeting between Sculptor Donald DeLue whose studio they were visiting and Harry and his art dealer friend. She wants to sell it- I can get photos of document. Would your auction house be interested? Hello Allan, Skinner’s Appraisal Department would be more than happy to assist you with more information about an Auction Evaluation for your friend. You can contact the Appraisal Department by phone at 508-970-3299 or email evaluations@skinnerinc.com. If you do have photos – here is the link to the appraisals form on our website: https://www.skinnerinc.com/selling/auction-evaluation-form/ Thank you!